When the Lord appears to humans we call it a theophany—a special and thrilling event that’s often very dramatic. Scripture mentions two types of theophanies: majestic appearances, like the one on Mt. Sinai where He appears amidst smoke, fire, and an earthquake; and non-majestic, where He appears in visions or in a form not instantly recognized. The Bible says He appears to Abram three times, revealing new covenant details on each occasion. Genesis 12:7 records the first theophany. While Abram has heard God’s voice calling him to Canaan, he’s startled by His appearance and His promise to give the land of Canaan to his descendants. The Lord appears to Abram again in Genesis 17:1, calling Himself El-Shaddai, or God Almighty, for the first time. This indicates He has the power to do the humanly impossible in fulfilling His promise to make of Abram a great nation. God then gives Abram and Sarai new names—another unusual event, considering the importance placed on one’s name in those days. To have God change your name is very rare indeed! Their new names have great significance, since they reflect His covenant promise and that they are His chosen servants. Abram means “exalted father,” but his new name, Abraham, means “father of a multitude.” Sarai means “my princess,” but Sarah means “a princess,”—not just Abraham’s princess, but a princess in a royal line. Both of them will give rise to a line of kings that will last forever, since God’s covenant is eternal. All these shocking and mind-boggling promises demand a response from Abraham: He must circumcise all the males in his household. Circumcision becomes a sign of the divine covenant because, in their literal thinking, it’s linked with reproduction, which in turn shows they all belong to God’s family. Thirteen years have passed since Abraham’s hopes first focused on Ishmael as his promised heir, and now he’s 99 years old. In blessing Sarah, God specifically states she’ll have a son the next year, in spite of her age. His name will be Isaac, meaning “he laughs,” reflecting the joy the baby will bring—and perhaps reminding Abraham that he laughed at being a 100-year-old father in Genesis 17:17. The third theophany comes in Genesis 18:1. 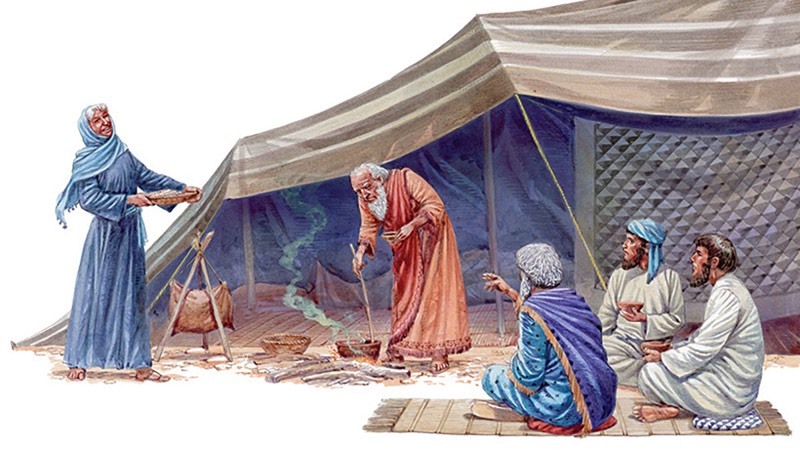 Abraham sees three men approaching his tent one summer, and following the ancient custom, he runs to offer them water to wash their dusty feet, shade to rest in, and a morsel of bread. This show of hospitality can transform potential enemies to at least temporary friends! Ancient custom then requires a meal be served that exceeds what is first offered, so Abraham asks Sarah to make a huge banquet, including cakes fried in fat and milk, using three measures (or 20 quarts!) of fine flour. Then he runs to get a fatted calf and a young servant to prepare it, before personally placing both curdled and sweet milk before his guests and standing by, as a servant, while they eat. “Where is Sarah?” one of them asks. In ancient custom, strangers would never refer to a wife by name, so undoubtedly Abraham begins to suspect these guests are not mere men. “Here in the tent,” he answers, and the conversation that follows confirms his suspicions. One of the strangers states that He’ll return “according to the time of life” (literally spring of the next year) when Sarah has a son. Listening at the door of the tent, Sarah laughs to herself at the notion of having a child at her age (just as her husband did)—then denies she laughed when the stranger calls her on it. “Is anything too hard for the Lord?” He asks, clearly revealing that He is God. The Lord is true to His promise and re-visits Sarah again when Isaac is born (Genesis 21:1).